Here is what I know for sure: we are put here on this Earth to grow, to expand – to learn and experience and understand. Growth and discovery are the purpose of life. Yet here is another truth I know for sure: I believe we tend to get in our own way. Our experiences, our cultures, and even our families can create fears and limitations that can hold us back, or hold us down. They don’t do this intentionally. It’s just that we’re all doing the best we can in this beautiful, messy, complicated world. There are so many circumstances or experiences that can get in the way of our growth and stifle our creativity and our lives. There are several mistakes we often make in our endeavors to grow, create, or experience something new. The first mistake is that we don’t take our instincts seriously. For example, have you ever said “I’m fine” when inside you were hurt or afraid? Or said “It’s not a big deal” when, in fact, it was consuming your every waking thought (and likely your dreams)? Or maybe you even rolled your eyes at yourself; told yourself that you were overreacting, or that a comment, dream, or feeling didn’t matter. Well, don’t do that anymore. It – whatever “it” is for you – does matter. It matters that you have a dream to start a business or take that trip or venture into something new. It matters that you want more than what everyone else is settling for. It matters that you are upset or unsettled or craving expansion in your life. It matters because those things are signs that you are not on the right track, signs that something is out there calling your name, signs that you’re ready to discover and devour it. And those signs should always be taken seriously. Listen to your inner voice. It’s there for a reason. The second mistake we make is that we don’t create enough space for continued growth. Growth requires space – actual physical space, as well as space in your schedule. They think it’s selfish. They have kids, work, chores, and obligations. It would be selfish to put those off just for themselves. Or they don’t think it’s possible. They have kids, work, chores, and obligations. Who has time or energy to undertake anything else? While both of those are really symptoms of not taking it seriously, there is more to it. If you think it’s selfish to create time for you to chase a dream, to process an emotion, to rest and reconnect , you’re missing one very important fact – you can’t give to others what you don’t have, and you don’t have what you don’t take the time to give to yourself. Growth requires self-compassion, patience, and generosity. If you ignore it, it will nag you, deplete you, and bury you in stress. But when you give yourself the things you need, you soon begin to overflow those same things -the compassion, patience, and generosity – back into your world. When your soul is filled up to overflowing, the feeling of impossibility takes care of itself. Make the things that matter—such as self-care, compassion, and authenticity – priorities, and you’ll find you have the time and energy to create the life you visualize. Another common mistake we make is that we label our efforts. Any time you start something big or life-changing with labels like “not good enough” or “stupid,” you shut down your growth before you’ve even begun. Because how can someone who is stupid or not good enough possibly do anything worthwhile? But you’re not stupid, and you efforts are good enough. You have to let go of the labels and approach your experience with an open mind and heart. This is what allows you to create possibilities that are more and better than what you know. If you’re struggling with this one, hold on to one truth: Each and every person was born pure, whole, and open to growth and learning. What messages have you heard? What are your beliefs about yourself and what you can do? 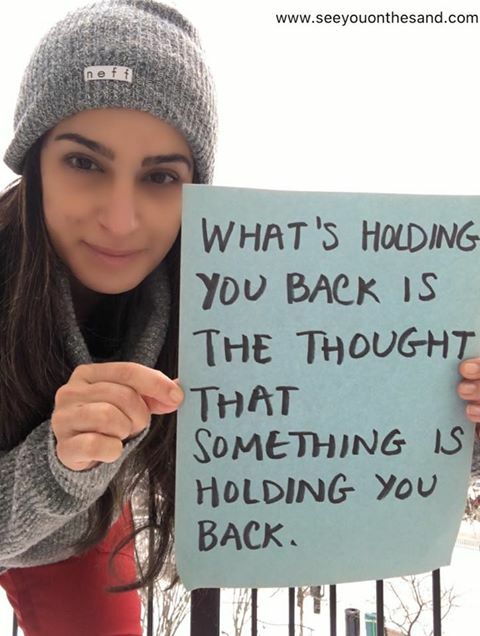 What things are holding you back from venturing into life?